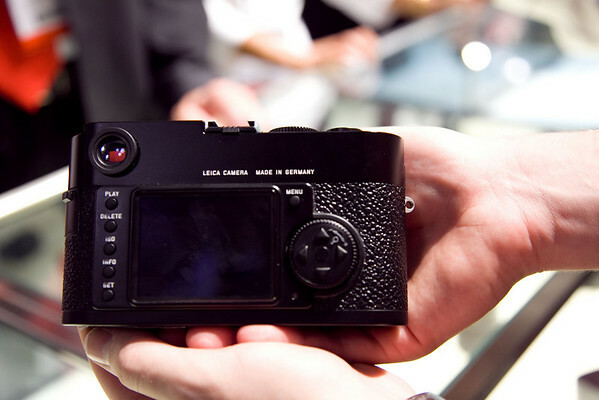 Since the announcement of the Leica M9, there has been much interest in the powerful but little camera. The main reason for this is the full frame sensor in such a small body. 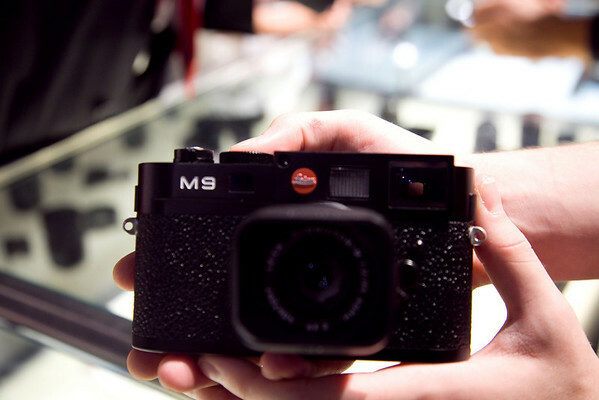 I had the pleasure and opportunity to finally fondle the Leica M9. I previously brought up the issue of really needing a rangefinder for street photography, and while I have not solved that question yet, I can tell you that the M9 has characteristics that surely can help with doing such things even at close range. However, it is not perfect. 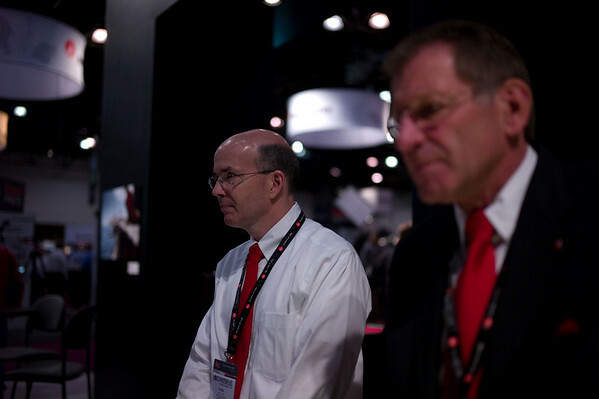 What you should know first and foremost is that the Leica M9 uses a Kodak CDD Full Frame sensor. 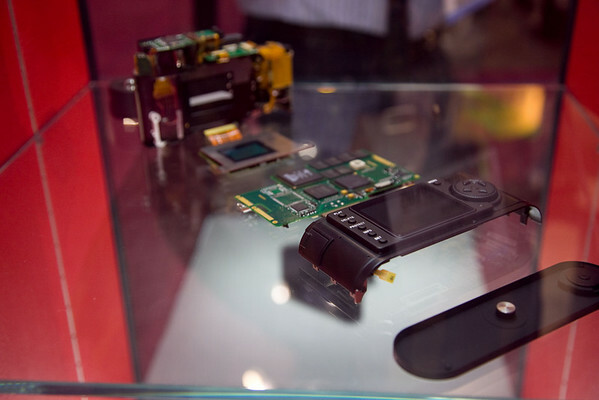 It is the smallest camera ever created to use such a large sensor. It shoots Adobe DNG RAW files at 5212 x 3472 pixels (18 MP), JPEG: 5212 x 3472 (18 MP), 3840 x 2592 (10 MP), 2592 x 1728 (4.5 MP), 1728 x 1152 (2 MP), 1280 x 846 pixels (1 MP). 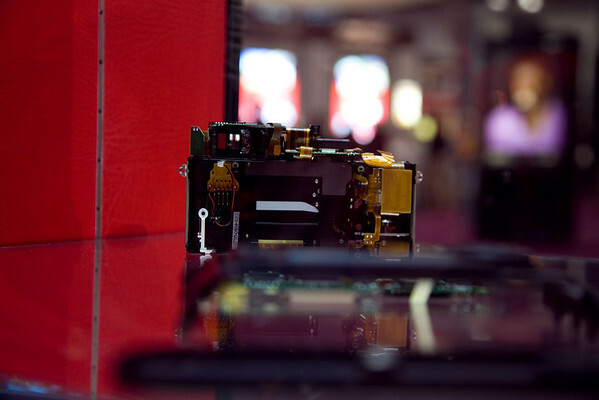 It shoots images to any SD cards; however, Leica recommends the use of SanDisk. Other cards are either not compatible or are a hit-and-miss such as the Kingston I used today. The founder of Eye-Fi Ziv Gillat let me know in a meeting today that the metal plate at the bottom seriously slows down how fast the pictures are uploaded. However, this may not be the case with their pro-line of products. 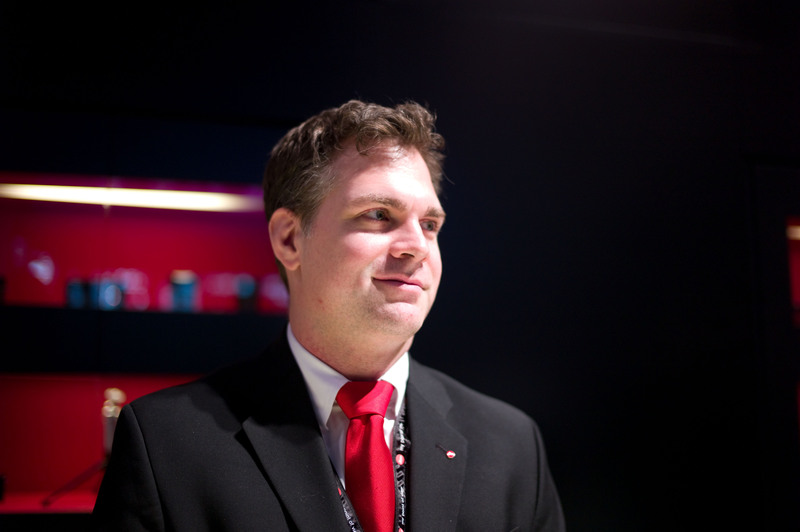 Leica says that this problem will be fixed in a future firmware update to come. ISO values range from 80-2500, meaning that Leica chose to take the safe route and not go up to 6400 and above the way that other full framers do. The camera does not have a flash. The display is a 2.5″ LCD screen which could truthfully be much sharper and higher resolution. It’s well below today’s standards on higher-end cameras with only a 230k dot resolution. 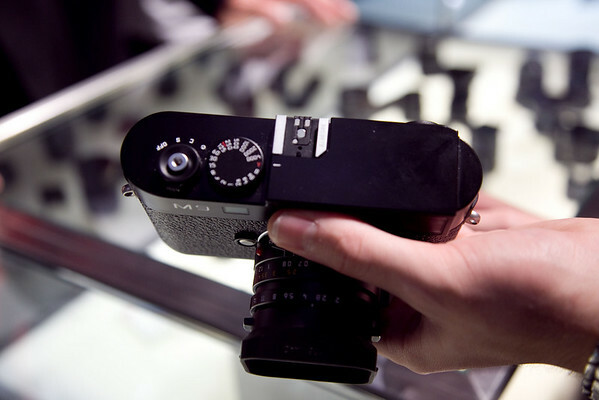 The Leica M9 feels like a light brick of a camera. You can shoot with the confidence that it won’t break, wont’ break down, and obviously your shutter won’t jam from dust or dirt. As you can tell from the guts being left out there for display, it is tightly packed into a small body. This my very first time ever getting the opportunity to shoot and hold a digital Leica. My first time holding a Leica was at the recent Pentax event that I covered last month. The body is designed in such a way that when you place your hands on it, the texture works with your fingers to allow you to grip onto it well. It does not feel like it will fall out of your hands and you can grip onto the camera as tightly as you’d like just to be sure. The tightly packed body feels like it can take as much pressure as you can possibly sanely put on it. 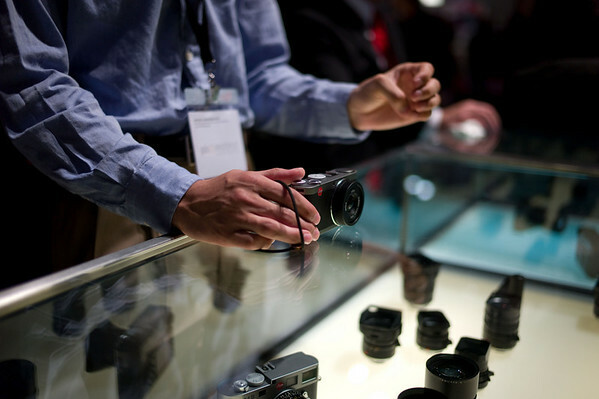 Shooting with a Leica is a different experience from using a DSLR. For example, focusing is much different. Everything you see through the viewfinder looks just like it would in real life. The exception to this is the little rectangle in the middle which is a different color and shows something that should not be there. For example, if you aimed it at someone’s face and placed the center on someone’s nose, the center may actually appear to be a cheek instead. You need to fix this by focusing correctly. To do that, you need to focus until you see the nose in the rectangle lined up correctly with the person’s real face. This may sometimes require even moving back and forth as almost all Leica lenses are primes. An article on Wikipedia explains this very well. The top of the camera shows the shutter speed control and shooting modes (which includes the on/off switch). There were times where I accidentally switched the camera off because the shutter release is right in the middle. This is the first time that such a thing has ever happened to me with a camera. Control for the aperture is on the lens itself (the way it used to be in the old days of photography and cameras.) The back of the camera is characterized by only a few buttons and a wheel to help with navigation of things like the menu and cycling through images. Actually shooting the Leica is quiet and you don’t even feel the shutter at all. To me, I actually feel more of a shutter on a Micro Four Thirds camera like the Olympus EP-1. A reason for this may be because of the solid construction of the Leica and the metal shell. Shooting wide open on this camera is harder than shooting with a more closed aperture because it requires you to really pay attention to what is in focus. Shooting with a more closed aperture is easier because of the extended depth of field. From my early tests, the Kodak CCD sensor does not seem to allow for the large dynamic range that the CMOS sensors have. Part of this could also be the DNG file standard as each RAW contains its own coding and information that it receives from the sensor. That isn’t to say that the images are bad, that is quite far from the truth. 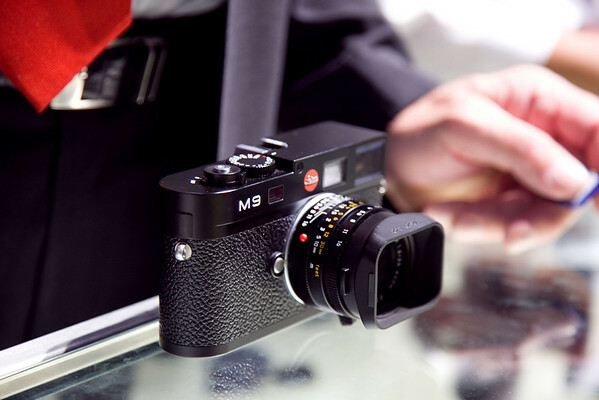 The Leica lenses allow for beautiful depth of field and spot on focusing due to full-time manual design. The M9’s center-biased TTL metering system will take some getting used to for those of us spoiled on multi-zone matrix metering. This is something to take into account when adjusting exposure compensation in-camera. Note the exposure based on the center subject’s white shirt and you can see how this center-bias affects the darker portions of the image. Overall, I’m very impressed with the Leica M9. While I do not think that the $7000 price tag is justified (which is seriously its only major drawback), Leica has done a tremendous amount of work to design and construct the camera. 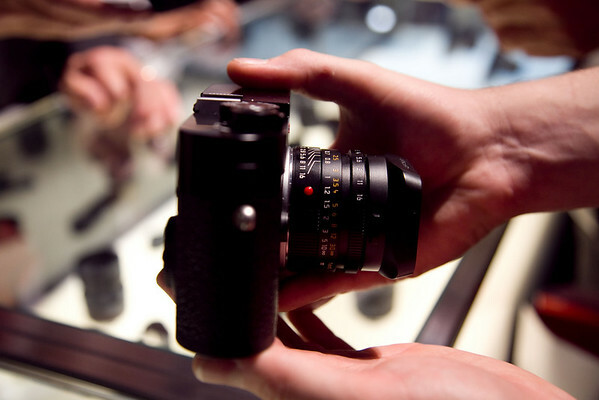 If you have a collection of Leica lenses, this is the camera to get. There was once a time in the history of Leica photography where one model of camera was a small but very significant incremental development of the previous model. The film went in the back, the lens went on the front and you had a smooth, small rangefinder camera, with lenses producing (usually) exquisite results. Photographers like Cartier Bresson used Leicas because there was(pretty much) nothing else around that would do the job as well. Enter the era of digital photography. Suddenly, the small, highly desirable Leica began assuming the proportions of technological dinosaur – In desperation, the M8 was released with quite a few bugs and a considerable amount of user dissatisfaction – the development continued and after a while, the M9 hit the streets with much hoopdey-doo and an eye wateringly high price tag. The second hand price of the now ‘old’ M8 tanked. You can persuade me to spend a small fortune on a lens (especially a Leica lens) and I would do so, willingly and with a great big smile on my face – Like a thing of beauty, a sharp lens will is a joy forever and will remain sharp for the rest of a photographer’s working life. Despite the fact that I have long admired Leica equipment. Watching charming video clips of ‘I can still remember mine father’s camera – Mine Got, it was so special and fantastic – because it was made by elves in the black forest’… Expecting me to pony up seven grand US to enjoy the warm fuzzy nostalgia of a camera system that should by all rights be in a museum, is pushing their luck. Sadly Leica have come up with an antique product (which they are trying to sell like their lives depend on it – and it does) and they seem to be pricing themselves out of the market. Spending big on a fantastic lens is one thing, paying through the nose for an underperforming camera that will be obsolete in three years is a question of “Emperor’s new Clothes”. Sorry, I’m not a cashed up pop star, I don’t give a hoot about going on an expensive nostalgia trip. You can spin it any way you like – I’m not buying it. I don’t know who started this story about Cartier-Bresson and the expensive Contax that he couldn’t afford. Cartier-Bresson bought one of the early Leicas in the early thirties because it best suited his needs, and it was an expensive camera for all that, as was the Contax. Both were excellent cameras, but Leica’s Oskar Barnak had invented the 35 mm camera in the 1910s and Leica was first firm to market a 35 mm rangefinder camera in the 1920s. By the time the first 35 mm Contax was on the market (1932) Leica was already producing their second model with great success. Cartier-Bresson came from an extremely wealthy family, and while it was his ambition not to depend on family money but to live and pay for his own life as a photographer he would certainly have seen to it that he got the camera he wanted for his work and would never have bought a camera just or mainly because it was affordable. The second myth frequently voiced in this context was that Cartier-Bresson (again mainly for financial reasons) always only used one lens (Ken Rockwell is also fond of telling this story). But there are plenty of photographs around that show that Cartier-Bresson throughout his career used at least two lenses, a 50mm (his favorite lens) and a 35 mm. Very occasionally he also used a small tele (90 mm). What he frequently said was that he never used extreme wide-angle or tele lenses because they didn’t correspond to human vision; he felt that photographs made with such lenses were for the most part “artsy” or mannered. P.S. I checked on some of the dates and prices: Cartier-Bresson bought his first Leica in Marseille in 1932, exact date or month apparently unknown; the first Contax (Contax I) came out in the same year. So it may or may not have been available when Cartier-Bresson bought his Leica. And re prices: The Contax was indeed more expensive than the Leica. For a Leica II, you had to pay about 210 Reichsmark, the Contax I cost 245 Reichsmark. But its reputation of being a tool (or toy) for the rich had to do with the very fast lenses that were offered for it right from the start. The fastest lens was a Sonnar 1.5 / 50mm, and was offered with the Camera for the astronomical price of 470 Reichsmark. Soon the lenses for the Contax had the reputation of being the best on the market, and they were certainly the fastest. But the Leica was apparently much sturdier; the Contax had a different type of shutter that jammed quite often, and was plagued by other problems. Leica in turn had already at that time the reputation of building their cameras to the highest standards. And with its retractable standard lens the Leica was flatter and more pocketable. Now what do we have got ? A real M camera. Off course, those who complain on the price complained already on the price of the M6 en the M7. That is not new. The M is not aimed at the consumer market. The M is a camera for photographers, for those who understand something about photography and dont rely on the -point and shoot and photoshop will do the rest- principe. More specific the M is aimed at the photojournalism and fine art market rather then sports other occasions because of the lack of autofocus and the limited range of the objectives upto 135m max. The difference between the M and the other dslr is that you control the image, you make the decision, not the camera. How many times i found myself cursing when the DSLR beeped error because my target moved to fast for the autofocus and no image was made. Now I set the distance and i decide when. No beep. The bouquets of the lenses adds to the simplicity of use of the camera to be a tool easy to work with, no video, lifeview and other gadgets, just a bright viewfinder so you can focus on what you should be doing : Making pictures and that is what a camera should be good in no ? Point taken the M8 was half way the road and the M9 is getting there, this is a steep learning curve for leica and you can argue that other DSLRs have more functions and more possibilities. But that goes for cars too, its nice but you dont need them.